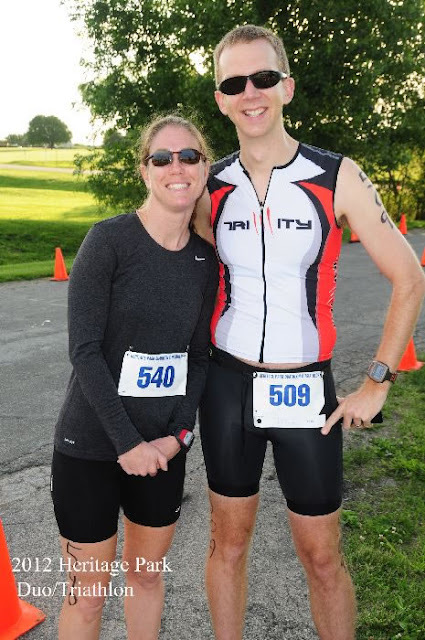 As I mentioned in my weekly report, I got a free race registration late last week through Amanda's (my sister-in-law) company. I waited a little bit to register so as to make sure I didn't take the spot of someone who actually works for the company. I was debating about my goals for the race because I knew my legs would be tired after running 12 miles of the Hospital Hill course on Saturday with Joe VI as well as ensuring I was fully rested for the actual Hospital Hill Run 5 days later. I was still planning for a threshold run this week, so I decided that this was the perfect opportunity to get it in. That being said, I still decided to set a goal for the race. Based off of recent race performances and training runs, I was hoping a 35 minute 8k was in sights. That's roughly 7 minute miles, which also happens to be a few clicks south of Boston Marathon pace. I decided anything under 38 minutes would be more than acceptable seeing that my threshold runs lately have been around 7:20 - 7:30 pace. This is the Amy Thompson Run for Brain Injury. It's in its 25th year of... um.... running and supports the Brain Injury Association of Kansas and Greater Kansas City. Very cool! I'm glad to be there to support this race... through my, uh, free race registration. 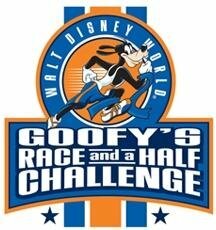 My Sister-in-law Amanda signed up for this as motivation to run a longer distance. Her previous best was 5k, so this was adding nearly two miles to that distance! My brother Mike was also running to get him back into race events for the first time this year. Yay! Today's Race Crew. Amanda, Mike, and me. 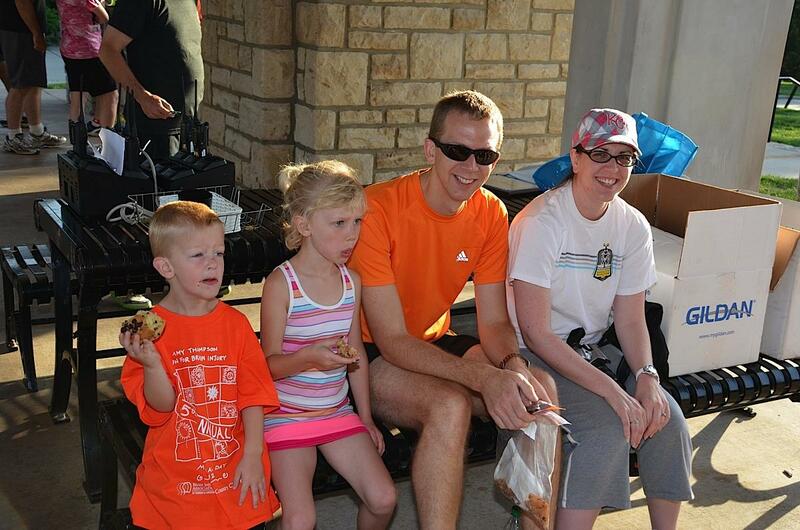 Well, if Amanda and Mike are running, someone had to watch the niece and nephew, so TKB signed on for that duty. Sam and Ella getting their pre-race nutrition in. 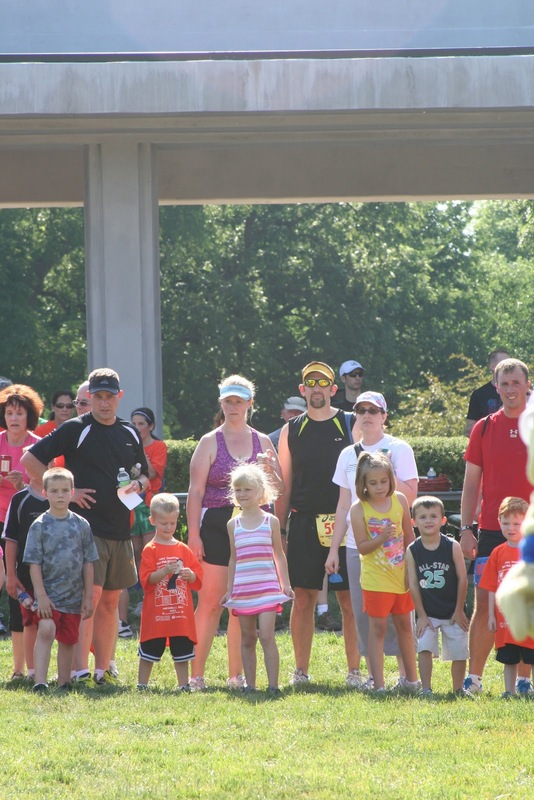 They had the Kiddie Dash to race later after the 8k!! Food: Banana & Bagel with PB. I did about a 3/4 mile warm-up and stretch prior to the start of the race and had a Gatorade G1 about 20 minutes prior to the race. The temps were starting to rise, as well as the humidity. After getting hugs and kiss from the kiddos and the wife. We headed over to the start line on Wornall Road about 10 minutes prior to the start. Amanda looked pretty happy to be doing something she'd never done before!! Mike with his game face on. Since I'm not a Speedy McSpeederson to get positioned up on the front, I was hoping there might be some pace markers to help people line up. I've learned to not care for the dodging and weaving, considering the fact that I ALWAYS go out too fast. I don't need that to wear me out. 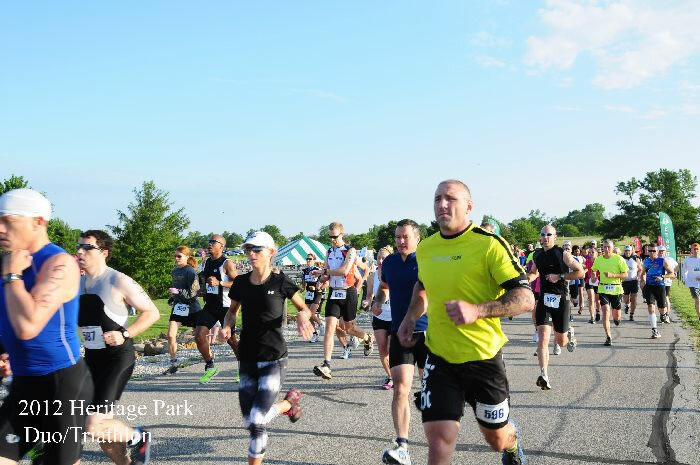 I ended up running the first 1/4 mile on the left (outside) of the group. This helped me pass people that I should have otherwise been in front. Yep. Too fast. This even had a nasty hill that I was planning to take slooooow. #fail In all honesty, it did feel like a slow pace for what I was trying to accomplish. I don't want to stare at my watch the entire time though. Some more inclines but these were a bit more gradual with some flats mixed in to get a breather. It was about this time that I was thinking to myself that I'm trying to do a whole marathon at this pace? There was an aid station in this mile, so I slowed for a drinky drink. Actually, I don't remember for sure but that's what I'm going to blame it on. It could have easily been that I slowed down because I may have started to lose focus. Or I was setting myself up for negative splits the rest of the way! Bringing the pace back down on this mostly flat stretch. It was along scenic Ward Parkway. I was tracking behind another guy that I was hoping to reel in and pass, so I found some motivation. I did kick up the pace a bit but there is also a nice decline that I tried to take advantage of because the last tenth of a mile is up the entrance to Loose Park and it's pretty steep. I hit it as hard as I could and, apparently, gave a guy in a much higher age group a "run" for his money. I mean that too, he literally kept looking behind himself about 5 or 6 times in that last .1 of a mile as if I had any chance of catching him...or any need to catch him. He was 19 years my senior. He said something to the effect of "Thanks for the chase" at the end, which marks the second time that has happened this year. I didn't even know we were racing each other. I'm struggling up that hill. And there is the guy looking back at me. While he did finish before me, I still beat him by 2 seconds by chip time. Good times though. 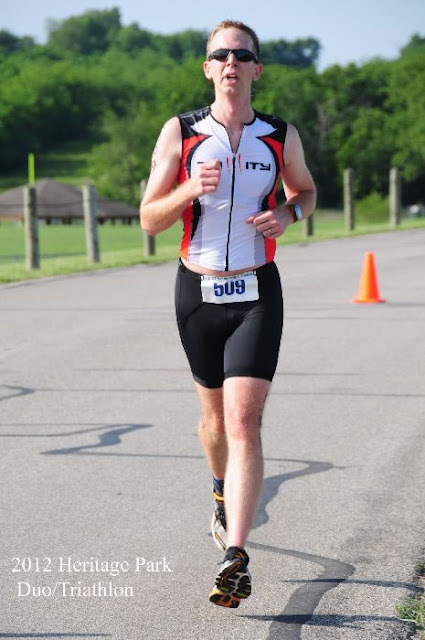 It was a good race and definitely hot. The post-race grub: Bottled water, frozen custard, muffins, bagels, bananas, oranges, milk options from Shatto (they had cotton candy milk? I grabbed a chocolate milk which turned out to be latte flavored), and at the end was a table of crab rangoon. Interesting! I felt like I was at the Thai-Japan Mini-Marathon! I will say that I'm happy with my progress. My Garmin time actually showed a 36:05 time (started/stopped them at the timing mats). I only point that out because, according to my Garmin, I was cruising along under a Boston Marathon pace. Doing that pace for 21.2 more miles seems quite daunting, consider Chicago is less than 19 weeks away. What I'm learning that focus is going to be KEY. I've completed two marathons and have never really had a problem with miles 20+ but this is going to be different. Mike in the yellow visor. PUSH IT!! The K. C. Wolf also showed up to cheer us on! This is apparently what I look like to a 4 year old. Sam stole the camera for a couple shots. 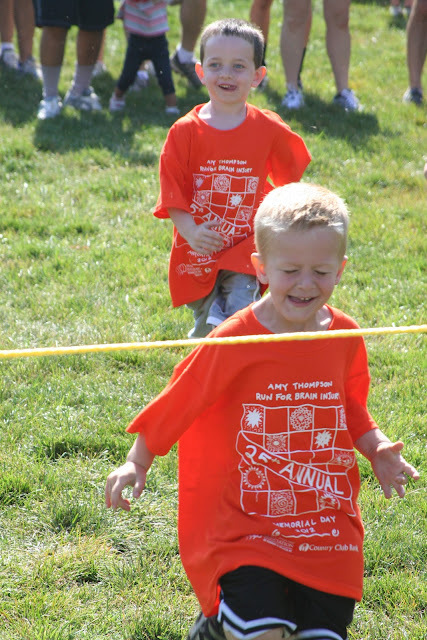 Sam flying into the finish line for the Kiddie Dash!! Ella waiting for the start. She got the memo about no race shirt on race day. I have a few things to teach Sam. I see some marathons in her future! 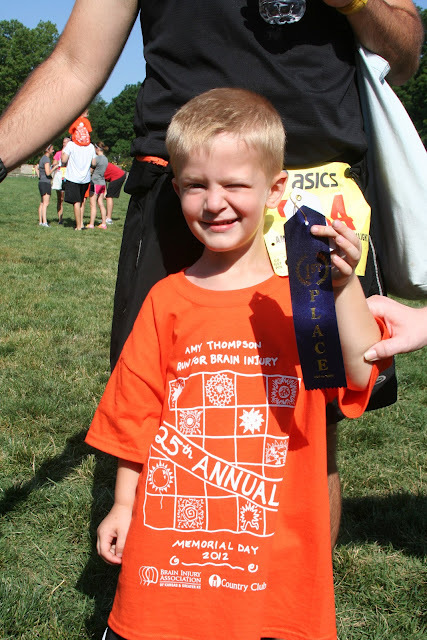 Look who got first place in his age group!!! Although, I saw every kid holding one of these.... I think there might be something wrong with the timing systems. 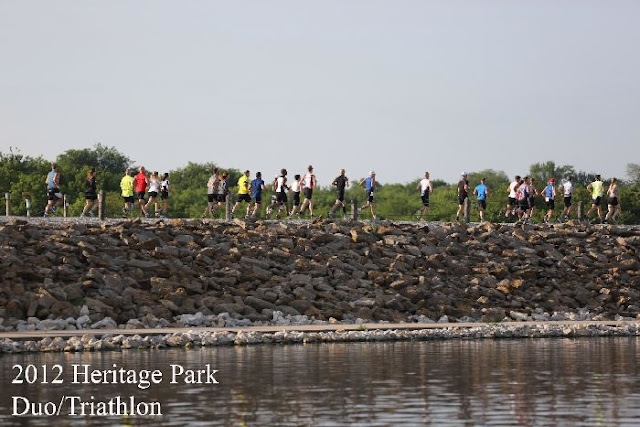 Even though this past week was a recovery week for me, I had other projects keeping me busy at home so I didn't get a chance to post about the Heritage Park Duathlon or my weekly workouts. 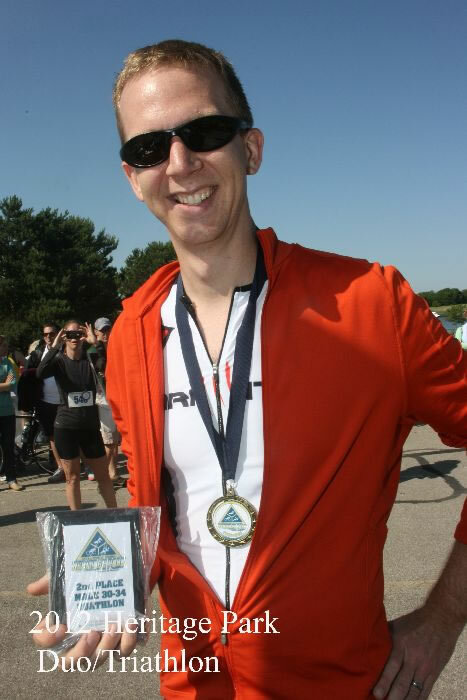 So I took care of the Duathlon write-up here and killing two birds with one stone on the weekly review. Very large volume week but that's mostly due to increased bike miles. 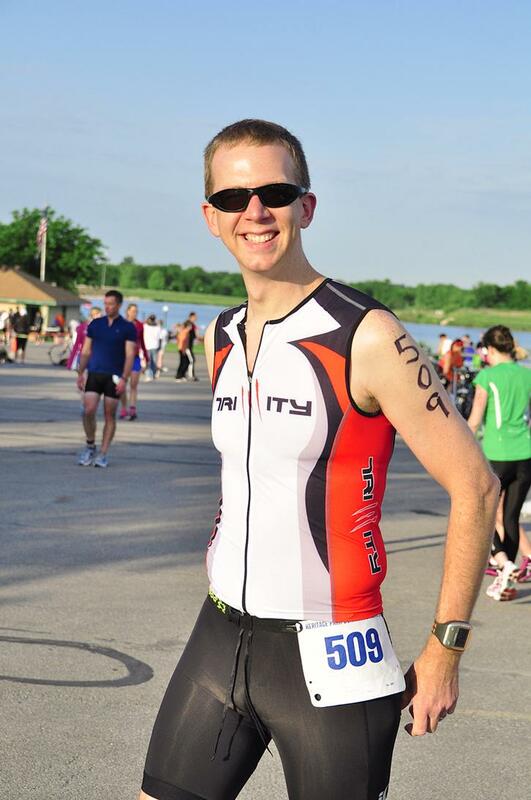 I did a 30 mile ride on Monday, rode to work on Wednesday, and tacked on 11.5 miles at the Heritage Park Duathlon. I am also in full training mode as I have added hill work to my routine. I just did three hills to get used to the idea. Basically I found a 1/4 mile hill that's about 5% incline. I take off at the bottom and push to the top. I then jog/walk back to the bottom as the recovery and redo. It is suppose to make your legs stronger. That's beneficial on both hilly and flat courses. Run 1: 3 mile "naked" run. I didn't bring my Garmin and all the electrical goodness that comes with it. I also went with a cotton shirt and gym shorts.... so it wasn't exactly naked. I even did something else I never do, I ran with headphones on. I listened to the Royals game (they won!) Just decided to change it up. 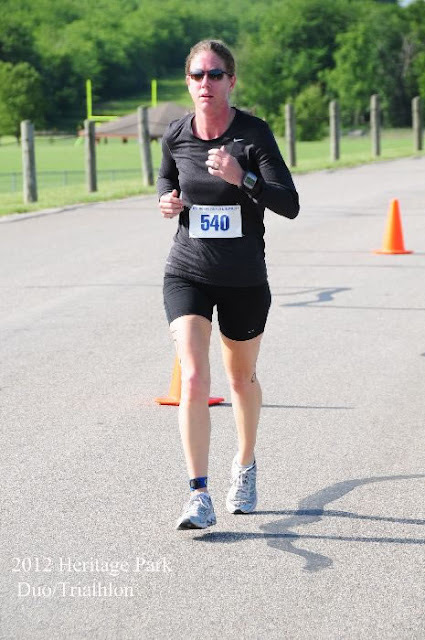 This easy, mindless run was to help recover from the duathlon the day before but I still averaged an 8:06 pace (I did keep track of my time on my cell phone but never looked at it during the run). 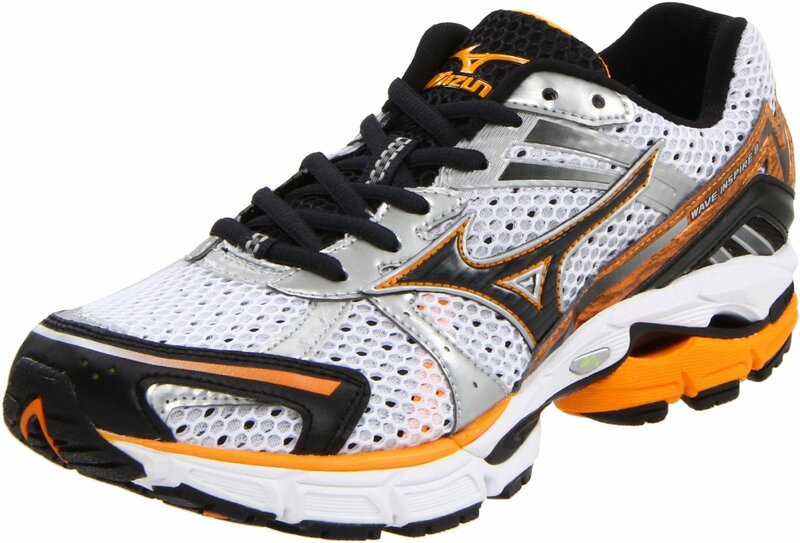 Run 2: 4 mile threshold run. I did a one mile warm up and then 4 miles at a hard pace, which averaged 7:28... with a few nasty hills. Run 3: TRACK! I did my first track session. 1 mile warm up, then 2 x 200 with 200 rest. Times: 44.4 & 46.1. 2 x 400 with 400 rest. Times: 1:35.5 & 1:34.9 and then an 800 at 3:20. Then cool down. Felt pretty good to do my first track session. I tried to run at a speed I knew I could keep over multiple repeats and looks like I did OK! Although, the next day Jill asked if I was still sore. I was never really sore, so I guess I didn't do it hard enough! Run 4: 11 Mile Hilly Run, somewhere between Long Run pace and race pace. Joe and I ran this together. I wanted to do a try-out for Hospital Hill, which is why I chose this route and pace. It was hard but we managed the 866 of elevation at an 8:23 pace. Just three weekends prior we did 8 fairly level miles at 9:30 pace and that was a challenge, so I'm seeing some great improvement! I feel ready to take on Hospital Hill after this!! I did got back in the pool finally. I was able to get 1000 yards in without resting. Looks like I can still float with motion ok. I still have that race announcement to work on for my previous training report. I'll work on that now for posting later in the week!! !